While my heart longs for exotic locales like the open prairies that merge with the horizon in Australia or the breathtaking seascapes of the Maldives, my fear of flying has me rooted. This doesn’t mean there isn’t a place for some tropical adventures set in the middle of mangrove forests and mystical jungles, and wrapped up in an eye-candy packages of sea-view rooms and exotic flowers. Located just a short ferry ride from Singapore, Bintan Lagoon Resort made the perfect place to explore the Riau archipelago of Indonesia. Bintan is a large island compared to all other islands in the archipelago and the accommodation options vary from backpacker friendly to a 5 star polished boutique resorts with sugar fine white sand beaches. 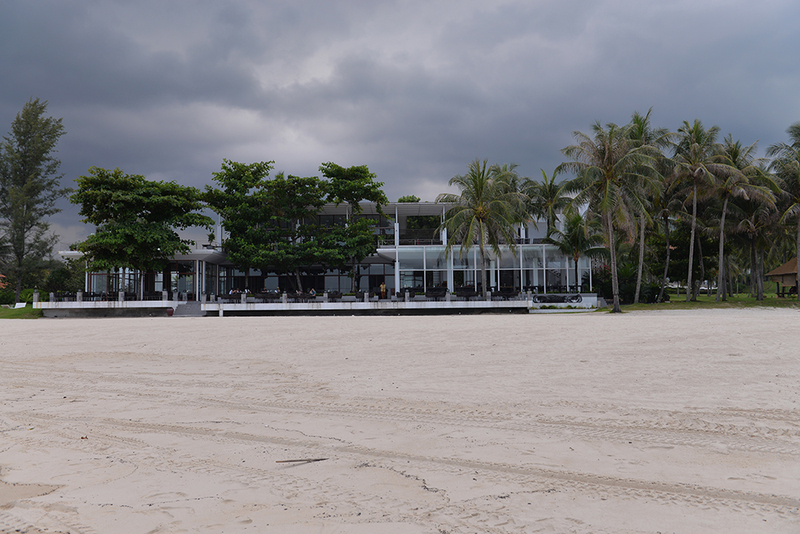 Me and Dilyan had the chance to check out Bintan Lagoon Resort and this is why I have decided to write up this handy-dandy post on our experience there. 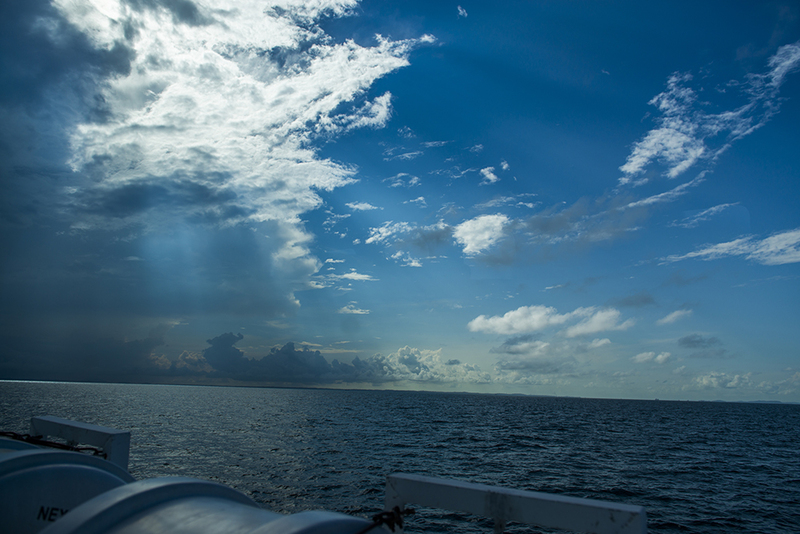 The view from the sea-view deluxe room. See, as I have mentioned before I HATE flying. Really. The next time I board a plane I will most probably have to be sedated (or the cabin crew will just have to put me in the cargo section, and that is if they manage to pull me out of the airport seats). So the fact that the resort had their own private speed ferry (and immigration terminal) was like a breath of fresh air to me. There really is nothing like having your own immigration terminal. Cuts down so much valuable time queuing and commuting. See, this 16 year old resort (highly popular among Singaporeans) has recently renovated some of its rooms. With over 470 rooms, suites and villas there is a wide variety of accommodation (and wallet-friendly options) to chose from. 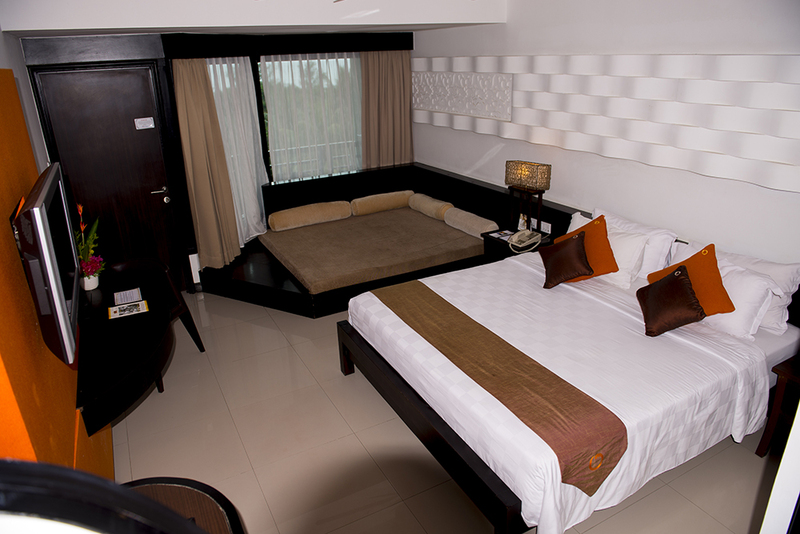 We had the luxury of staying in one of the spacious sea-view deluxe rooms, which was set in warm colors. So as we settled down and took in the beautiful view from our own private balcony we decided to explore the beachfront gardens and luxury golf courses. The resort’s beachfront was beautiful. Imagine a crystal clear water with a hint of colorful fishes and fine white sands that squeaks under your feet. The crowd was formed mainly from people with nothing more than few squirts of sun screen lotion and swimming suits. There were tons of sea activities to chose from, but I didn’t participate since I’m horrible at sports that involve separating myself from the earth with some kind of slippery surface (and have the survival skills of a garden snail). 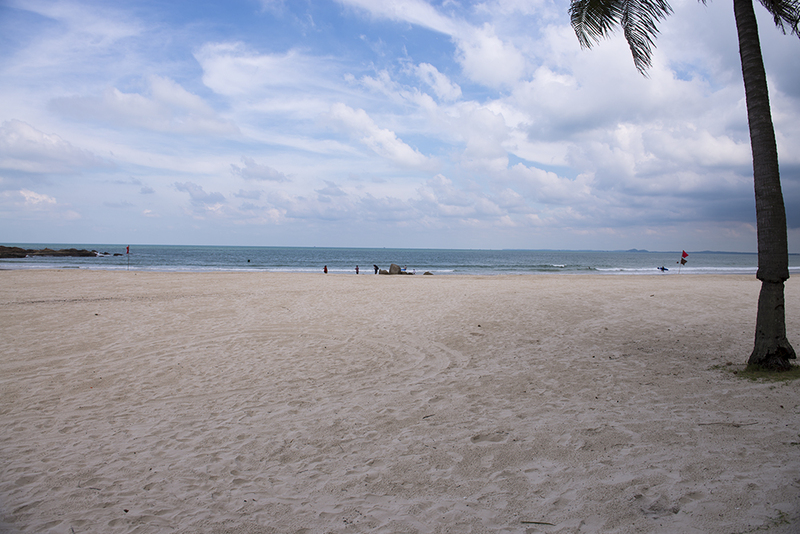 The beautiful white sand beach. After indulging in some SPA procedures we joined the other guests at Rice, Bintan Lagoon Resort’s beachfront restaurant, for dinner. I had the grilled chicken which was tender and full of flavor, and Dilyan got the Nasi Goreng (chicken with traditional Indonesian fried rice, fish crackers and peanut sauce). The mood was set by the crashing waves and jazzy music. The beachfront restaurant at the resort. The next day we got ourselves a golf cart and decided to blend in with the golf players at the exceptionally designed championship 18-hole golf courses. 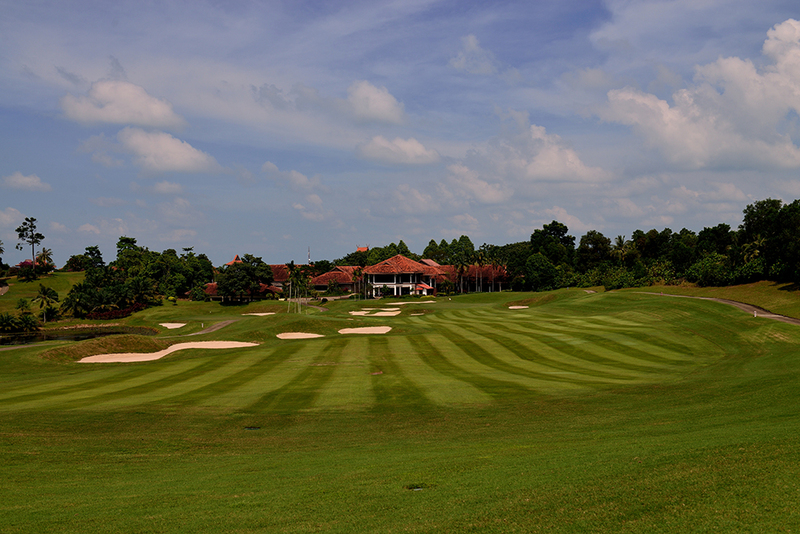 Bintan Lagoon Resort have very tempting golf packages (prices starting from $175) and golf lessons, but we decided to enjoy the golf course from another perspective – the one from Haskell’s restaurant. The beautiful golf course and Hackell’s restaurant. The restaurant (specializing in Indonesian and Indian food) was overlooking the green hills of the course. 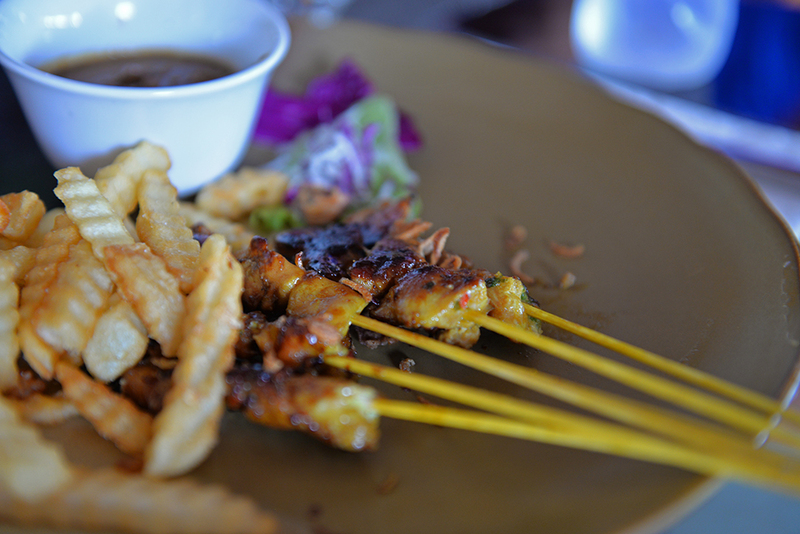 I went with the Club Sandwich, while Dilyan was feeling adventurous and tried the Chicken Satay (grilled chicken with a portion of rice or french fries and a peanut sauce). 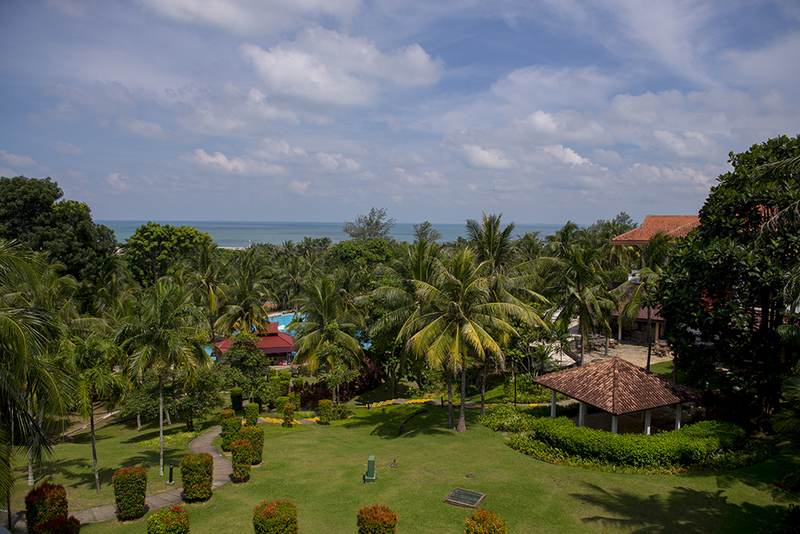 You can book your stay at Bintan Lagoon Resort via Journeyful, which usually has the best rates. Ferry pricing (return trip) is from S$62 (adult) and S$52 (child) for off-peak periods.